There is an overwhelming amount of choices out there for kitchen splashbacks. Here is some information on popular varieties to help you narrow down which splashback is the right choice for your new kitchen. Best practice is to first select your benchtop first before deciding on a splashback. Generally, there are less material and colour options for benchtops, compared to your limitless choices of splashbacks. This will immediately narrow down your material and colour choices. 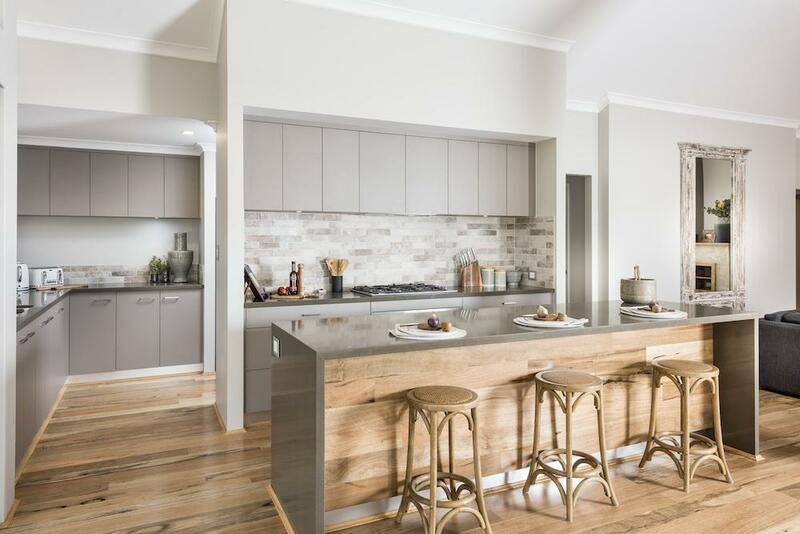 Depending on you benchtop choice, you can decide whether you want it to take centre stage, in which case, you should opt for a subtler, minimal splashback that won’t draw attention. If your benchtop is neutral, opt for a feature colour for your splashback to add some interest and character to your kitchen. There are two main factors to consider when selecting a splashback; colour and material. Rural Building Company love a combination of colour and texture to add interest in our country kitchens. Note: Each splashback has different maintenance requirements; most can be wiped down with a damp cloth to remove general mess but some surfaces may require proper cleaning agents. Some of the most common materials include glass, stainless steel, pressed metal and tiles. Tiles look particularly good when the rest of the kitchen understated. Grout lines add visual interest to the space, keep in mind the smaller the tile, the more the grout lines – gauge the size of your tile based on how busy you’re happy for it to look. There is a wide range of styles, sizes and textures available, as opposed to a glass splashback. If you’re looking for a traditional look for your kitchen, wall tiles are a great option. As wall tiles have always been traditionally used in kitchens, a country kitchen will look great with a wall-tiled splashback. 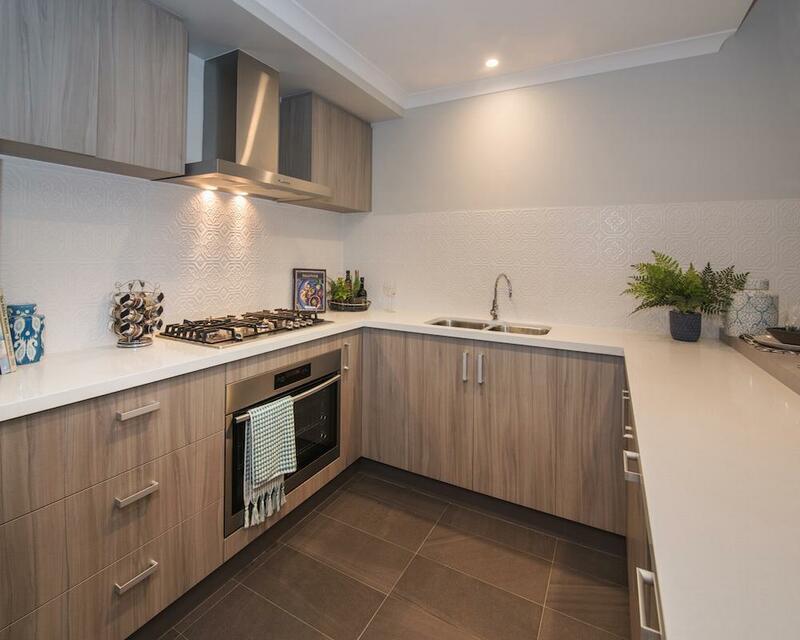 Some of the greatest reasons to go for a tile splashback is it is cheaper in cost compared to other materials, easier to cut to size and you have the option to select a ‘feature tile’ to use in certain sections. Wall tiles have a lot of variations in textures and patterns if you are having a stone bench-top that is quite glossy, you could do a contrast to that with a matte tile. Mosaic tiles look beautiful but they are more difficult to clean than larger tiles. Providing your kitchen wall is smooth and flat, a laminate splashback is a simple and effective option. The laminate is glued to the wall using an adhesive before your cabinets are installed. For cases where the wall is not flat, apply the laminate to a villaboard that can be fixed to the wall. 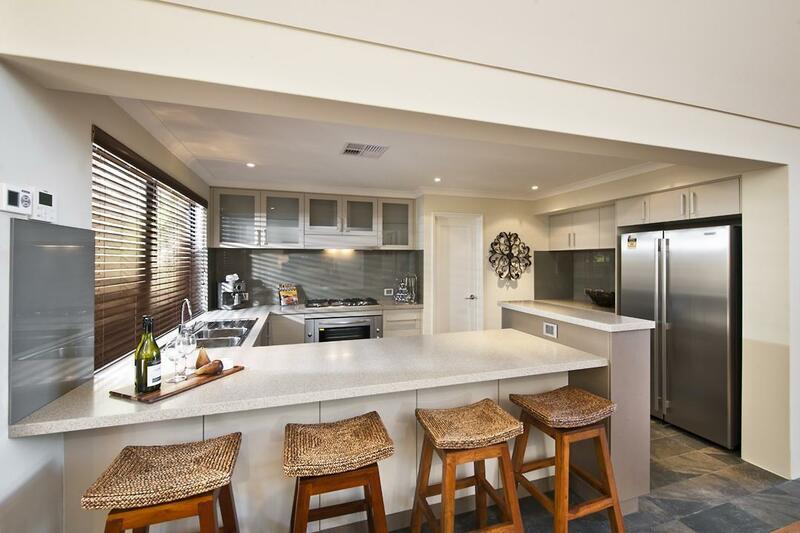 A laminate splashback can be same colour and pattern as your chosen benchtops or you could go for a contrasting look. It is completely water and wear resistant giving you an attractive surface for an attractive price. Glass is a very popular choice in contemporary/ streamlined style kitchens and is predominantly colour friendly giving you the option of pretty much any colour you desire. Common colouring techniques are ceramic frit and two-pack urethane. Ceramic paint is screen printed onto the glass and then baked on during the toughening process. Urethane treatments are usually spray-painted onto pre-toughened glass and then either air dried or baked on. Glass has the advantage of creating a brighter kitchen. It has great reflective qualities, which will help to bounce light around the room. Because there is no grout with a glass splashback, this makes it super easy to keep clean and does not allow mould/fungus to grow. Glass splashbacks are generally used in a contrast colour to the cupboards and other features. This way, your glass splashback can become a stand out feature of the kitchen. If you want super slick and modern, then glass could be the perfect choice for you. This being the cheapest of options, a painted wall is done the same colour and at the same time as the other kitchen walls. This can be done in non-wet areas of the kitchen, however other materials such as tile will still need to be used for areas such as the sink. This option will just cost you a litre of paint plus the labour. Following the cheapest option is one of the most expensive. This solution is very effective when the benchtop and splashback are in the same colour and material. It will give the visual effect of having a much deeper benchtop when viewed from a distance. Stone has no grout lines and can be easily cleaned fastidiously. If you would like to go for a more traditional look, then pressed metal works great in a country style kitchen. They are fantastic splashback option that adds a durable, high quality and beautiful element to the area. Powder Coating is the recommended finish for panels when they are being used in a highly exposed area. The cleanliness is of pressed metal is easily maintained with a gentle soap and cloth. A mirrored splashback in bronze or silver has become increasingly popular. For those who have a smaller kitchen, deciding on a mirrored splashback will add size to this space. Keep in mind this choice does not suit every home but in the right kitchen it can do wonders for the feeling of space. You can keep an eye on everything that is happening behind you as well as cook, however this splashback will require daily cleaning as it exposes every speck of dirt. Mirror and highly reflective splashbacks highlight dirt and grease.